What is the difference between hibernate get() and load() methods ? this is one of the famous hibernate interview questions, most of us will use hibernate get and load methods irrespective of knowing their exact behavior 🙂 will you accept that ? of course even myself too in the initial stages 🙂 Today i will try to clear that confusion. Then what’s the difference them ? lets start with load() and then get() method. When you call session.load() method, it will always return a “proxy” object, whats the meaning of proxy object ? 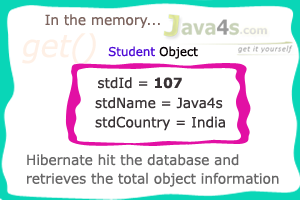 In index.jsp > line number 4, i have called s2.getStdtId() and hibernate simply printed 107 [at Output > line number 3] without creating any database query why ? because as i have explained hibernate will prepare some fake object with given identifier value in the memory without hitting the database. 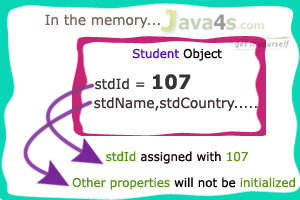 So when we call load() method (at index.jsp > line number 2 ) with 107 value, hibernate will create a fake object with 107 as identifier value, i mean temporarily it will consider the student id as 107. If you observe the output, hibernate was generated the database query (at Output > line number 4 ) when we called s2.getStdName(); ( index.jsp > line number 5 ). That’s it, so finally we came to know that session.load() will hit the database only when we start retrieving the object (row) values. Really simple explanation and easy to relate. Thank you very much. Article is very very good. sorry to say in this way: I know the difference as per my text book but in real time in which scenario we have to use load/get till not getting and not assuming also. if you give a simple example , that can be remembered more easily. first of all i thank you very much. your explanations are very nice. it’s easy to understand. My doubt is, get() returns nullpointerexception if the data is not there in the database. you told it returns null. i’m totally confused, can you give a clarification? Nagarajan: get methode return 'NULL' value when we call Student st=session.get(); if no row exist in the database. Can we conclude, that load() is used for lazy loading and get() is used for early loading? If possible can u please provide JSF tutorial also. Really very good explanation.if u try to upload some this type of explanation in other tutorial like Core java,its very helpfull to all . Your explanation too gud.. keep up the gud work !!! This hibernate tutorial is very good, I had few queries/doubts before reading this tutorial, but now i am very clear. Thanks a lottttt. Nice Explanation in easy to understand way.. Colorful text makes it pretty clear in terms of readability. Each and every word makes sense. Nice explanation this would help to others very much. Easily understandable…… I think all get benefited by u…. Very Good Explanation really helpful. Really its a great explanation. null if the object can’t be found. Very good and lucid explanation, the very best i have read until now, keep up the good work, all the best!! Thanks buddy !!! If u know pls tell us how merge method works in hibernate. Good explanation…just want to add on load() method…. Session.load() will use (lazy / eager) loading depends on implementation of persistent class – Final / Non Final. 1. If persistent class is non final then hibernate build proxy of class in cache and use further lazy loading to get others class properties by hitting db. 2. If class is final then hibernate cannot build proxy of class and use eager loading by hitting database. thanks alot Sivateja Kandula for your well designed material for beginners.learnt alot !!!! Thanks for explained nice example. Thanks a lot Sir, this is very clear explanation. Everytime when I tried to understand the difference between load() and get(), I never understood what the proxy is. But you have explained it very well. Thanks very much for ur explanation …. two method…what is the best…why load returns…proxy…when to use what.. Very nice explanation..Thank you very much!! Can you please share difference between lazy loading and eager loading with example and well explanation? thank you Sivateja, Simple but best explanation …. Nicely explained the difference between get() and load() method.Thanks a lot for sharing such useful information. Here,I would like to add one more point regarding when we can go for get() and load() method.If you agree upon it,please go ahead and implement in your application,else ignore it. load() – since, it returns a proxy object of requested entity,we can use it for lazy initialization purpose,where we need only a reference of an object and no other its properties.It actually saves DB hits. one precaution we have to take is that we should use this method only when the data is present in the DB ,else it throws the exception. get() – we should go with this method when we want to make sure the required object i.e. data is present in the DB. doesn't make any sense, in both cases data should be there in the database. How does It makes any usages difference. Very good explaination:) Way to go !!! Thank you very much for these good tutorials. Thank u For this tutorial, and Very Good explain. really its a very very good explanation…. really explained very simply and can be understand easily. please explain more about load() and get() for annotation.. Very nicely Explained, Thanks sir. Could you please explain about locking in hibernate. how to create proxy object in session.load().method,can u explain the internal proces? Hello Sir,Your Explanation is super with graphical representation and with simple examples,Thank you Sir. I am getting an error called " org.hibernate.service.spi.ServiceException: Unable to create requested service [org.hibernate.engine.jdbc.env.spi.JdbcEnvironment] ". Clear Explanation , Easy to understand thanks for sharing. Finally, i have completed this tutorial. Your tutorial is very easy to follow it. You said —- so which is the best method to use, hibernate load() or get() ? its completely your choice. I am not satisfied.. I think load() method is used whenever you are sure about the existence of an object otherwise get() method is used cause when you call load()method with 101 id which is not exist in db then hibernate returns you as proxy object with 101 id i.e not right.so it choose whenever you are sure about exist of data. How can you predict whether the data is available in the DB? I cant predict about the existence of data but i want to say that there is no means of load methods because if there is no data in db it return proxy id 101. So it is always choose to get methods right. I agree, but if you choose get, lets say object is not available in the database, it will return NULL and further if we do any operations on NULL it will throw NullPointerException, then both Load and Get doing the same! Came here for a better though. I found basic one. Not bad. Awesome. Now I got it. always wondering when load exception is thrown without checking identifier. how it created proxy object etc. U rock Man!! Your way of explanation is awesome. Very easy and clear to understand the concept and especially with this kind of explanation its very easy to remember the things in memory. Hibernate: select product0_.p_id as p_id1_0_0_, product0_.price as price2_0_0_, product0_.p_name as p_name3_0_0_ from product product0_ where product0_.p_id=? Very simple and clear explanation. Saved so much of time.